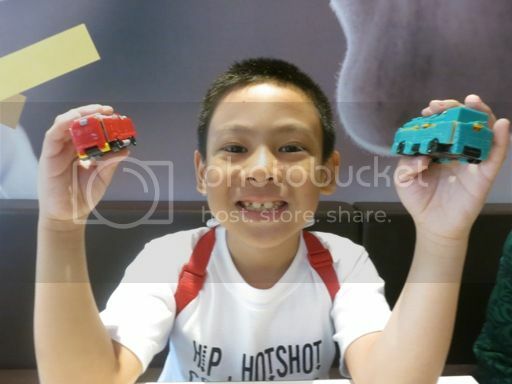 Six days ago, we went to McDonald’s Greenhills to pay the deposit for my son’s upcoming 7th birthday party. When I was busy talking to the manager, my son was preoccupied with the new Happy Meal toys on display: Hello Kitty toys for girls and Voov toys for boys. I already knew what he’d tell me next, and I was right. He asked if he could have a Voov truck. It was almost snack time already, so I didn’t really mind buying two Happy Meals (4-pc Chicken McNuggets with orange juice and McSpaghetti with orange juice) so he could get not one, but two, Voov trucks. These toys, after all, come for free, so it’s really not a hassle acquiring them. They’re actually a welcome addition to my son’s growing number of toys. These Voov trucks are transforming trucks. With a few simple steps, you can convert the Voov Fire Engine into a Voov Truck and the Voov Cargo Truck into a Wheel Loader. That’s cool! No wonder, the little boy liked them. It’s like having four different trucks for just two Happy Meals. As you can see, the little boy was all smiles in this picture. Those Happy Meal toys made him very happy and the Chicken McNuggets, too! Do your kids like Happy Meal toys, too? What Happy Meal toys have your kids recently acquired? This entry was posted in Happy Meal Toys, Happy Meals, McDonald's, Voov Toys. Bookmark the permalink. I got my little boy the white bus from happy meal and hello kitty toys for my little girl. We never have boys toys in the house ! I have a daughter and two nieces so all our happy meal toys are either hello kitty or barbies. Ang ganda talaga ng happy meal toys ng McDo! I used to collect them myself especially the Snoopy collection in the 90s. I was surprised during our visit to Jakarta that KFC there had a similar thing. Their snack box (kid’s meal) had a free toy from plants vs zombies. Being a fan of PVZ, my daughter loved the peashooter, sunflower and cabbage pult. KFC here doesn’t seem to have that. I’ll check next time I’m in KFC.